Why should a stone/concrete protector be used? Products such as UGL Drylok’s concrete protector or Drylok natural look sealer will extend the life and beauty of your stone, brick, or concrete by providing an invisible protection against road salt, harsh weather, acids, gasoline, oil, etc. They also help to prevent pitting, surface cracking, and efflorescence (unsightly white powder deposits). My concrete driveway has been sealed before, does it need to be sealed again? Concrete sealers such as Drylok’s products typically will last about 2-3 years, but it is recommended to perform a water test each year to determine the need for a sealer. Simply sprinkle a few drops of water on the masonry surface. If the water lays on the surface it is still protected. If the water is readily absorbed by the masonry, it is time to apply another coat of concrete protector. How is it applied? Application is quite simple. The biggest trouble at this time of the year is finding the right day to do the work. You will want to choose a day when air and surface temperatures are above 50 degrees F and when relative humidity is below 60 degrees. Drylok’s concrete protector may be applied with a brush, roller, sprayer or squeegee. It goes on milky white and dries clear. Do not apply if rain is expected within 24 hours. Will a concrete protector prevent damage caused by road salt? No concrete protector is rated for complete protection against road salts and ice melters, however they will help prevent some damage caused by the frequent freeze/thaw of snow and ice on the surface. Think of concrete protectors as an invisible coating. This coating will breakdown over time with the use of salt and ice melters, but its presence will prevent water from penetrating the concrete. Over time, this water would freeze/thaw and cause create those unsightly pits, chips, and cracks in your concrete. 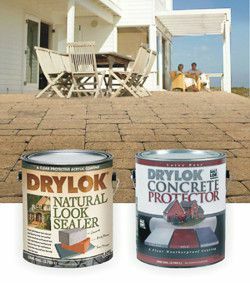 In short, concrete protectors such as Drylok’s products will help, but they will not provide total protection. If you have any more questions about these concrete protectors, please visit our paint department in-store. Thanks so much for reading!